Westbourne Motorsport head to Rockingham Motor Speedway this weekend [11-12 August] keen to cement their Renault UK Clio Cup title credentials as the 2018 title fight reaches a critical stage. Just 25 points separate James Dorlin from the points lead after five race victories and a further two podiums – the most recent at Snetterton a fortnight ago – have thrown the BRDC Rising Star into the hunt for Westbourne’s first title in the highly-competitive category. That success has come about in no small part due to experienced contender James Colburn, with the 2011 championship runner-up keen to make a podium return in Northamptonshire after a recent string of consistent points. Both will need to keep a watchful eye behind, however, with series newcomer Ben Colburn impressing on his championship debut in Norfolk and, with two podiums in the Michelin Clio Cup Series last weekend at Snetterton, the expected capacity trackside crowd will watch with interest as he continues to get to grips with the fourth-generation Clio Cup machine. As usual, fans can catch all of the on-circuit action through ITV Sport’s live, free-to-air television coverage on race day. An all-important qualifying session kicks off proceedings at 11:20 BST on Saturday, with the opening race later that afternoon at 16:10. The weekend’s action at the NASCAR-style speedbowl concludes with the final contest at 13:30 on Sunday. James Colburn (#7) said, “A strong team result is certainly on the cards this weekend. Rockingham has always been a strong hunting ground for Westbourne Motorsport, and this weekend should be no different. 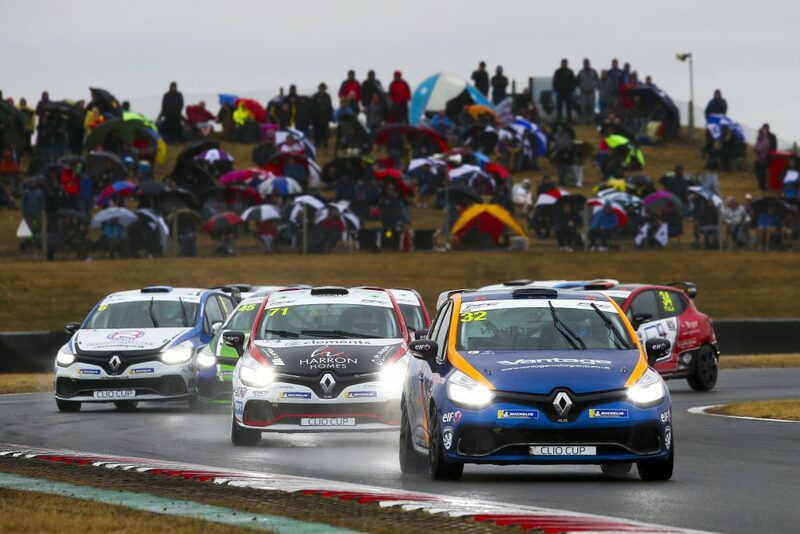 James Dorlin (#32) said, “Rockingham is an important event for us in that we’re now into the final few rounds of the Renault UK Clio Cup season and the title is still very much within reach. “The plan is to go out and gain as many points as possible whilst also hopefully adding to our tally of race victories. I have the best team around me in Westbourne Motorsport to get the job done, and the support of several loyal sponsors who make this all happen. Ben Colburn (#55) said, “I’m really looking forward to my second weekend in the Renault UK Clio Cup – hopefully some unfortunate mechanical problems won’t hit me this time, and we can have two strong races. “The aim is to match – if not improve – on my debut weekend at Snetterton, which went better than expected. I’m certainly looking to pose a headache to several of the UK’s best racing drivers and take home some strong results for the team which, in my opinion, has never looked stronger than it does right now.